MEXICO – January 21, 2015 – In partnership with As Deporte, Competitor Group, Inc. (CGI), the active lifestyle industry’s leading media and event entertainment company, today announced the continued expansion of the Rock ‘n’ Roll Marathon Series with a second event to Mexico in 2015 with the Rock ‘n’ Roll Mérida Half Marathon set for Saturday, October 31, 2015. The new half-marathon will start at night, taking place over the Day of the Dead holiday weekend. CGI first announced a partnership with As Deporte to bring the Rock ‘n’ Roll Marathon series to Mexico City last summer. The inaugural Rock ‘n’ Roll Mexico City Half Marathon will take place at night on Sunday March 15 and registration has sold-out with 10,000 entrants. Starting at sunset, the Rock ‘n’ Roll Mérida Half Marathon will offer participants a stunning tour of Mérida, located in the heart of the Yucatan Peninsula a city is known for its beauty and cleanliness. Approximately 5,000 runners and walkers of all abilities can celebrate Day of the Day weekend with a 13.1-mile journey featuring live music, themed water stations and thousands of cheering spectators. The running festival experience is topped off with a finish line concert featuring a major headline act. Rock ‘n’ Roll Mérida Half Marathon is opening registration for 24-hours on January 30th with a special price of $65, and will increase to $75 on February 6. Registration will be available online at RunRocknRoll.com/Merida. Race weekend in Merida will begin with a two-day Health & Fitness Expo where all participants go to pick up their race number. The expo will feature several running and fitness retailers, exhibits with free nutritional samples and a series of interactive clinics. The city of Mérida is now part of a worldwide series of musically-themed marathons and half-marathons, uniquely combining entertainment and running into the ultimate running “block party.” The race is one of two events in Mexico, and joins the Rock ‘n’ Roll Marathon Series’ global tour schedule of 30 destination races in the United States, Canada, England, Ireland, Portugal and Spain. Over the 18-year history of the Rock ‘n’ Roll Marathon Series, charity participants have raised more than $305 million for a variety of worthy causes and nonprofit organizations. 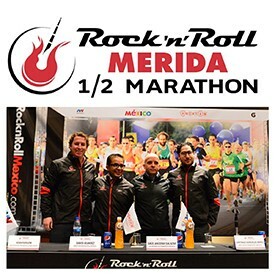 For more information about the inaugural Rock ‘n’ Roll Merida Half Marathon, please visit runrocknroll.com/merida.